This weekend was SUPER busy! I felt like I hardly had time to sit still for more than 5 minutes at the time! It all started Friday night. A quick grocery store run turned into a marathon and 3 stores. I was running wild trying to get home and ready for dinner. Justin and Farrah picked me up and then we grabbed Jonathan and Denise and headed down to Birmingham, where we met Forrest at Little Savannah. Since J and D hosted us at their home last month, they got to pick the restaurant. We SO enjoy our mini food road trips, and Friday was no exception. The restaurant has great charm and atmosphere. We were a little disappointed that they wouldn't let us sit at the bar for a while before we went to our table, which was our plan all along, but they said they were too busy at the bar and showed us right to the table, which happened to be situated right by Chief Justice Sue Bell Cobb's table. We decided to start with appetizers as usual--a cheese plate for us, shrimp and grits for Justin, a salad for Farrah, fried quail for J and D, and a bowl of mussels for the table. The mussels were VERY good and went VERY fast!! For dinner, Forrest got lamb, which he says was to die for, and I had snapper, which was very good but raw in the center. Farrah and Justin both got the snapper too and theirs was fine--leave it to me to get the raw one. I also didn't receive the mac and cheese I ordered, which was a little sad, especially since I couldn't eat all of my fish. Despite the "sushi" dinner, we had a great time laughing and telling stories as usual, and Forrest and I didn't make it home until 11:30! On Saturday, we both hit the ground running. For her birthday (which we celebrated last Thursday with a traditional pizza party), all Forrest's mom wanted was for her boys to help their dad clean out the shed behind the house. What an event!! Forrest was busy cleaning and organizing all morning! While he was being a good son, I was in domestic diva mode. I had laundry to fold, tons of things to unpack and put away from the Girlfriend Gala (more on that later) and a batch of Neiman Marcus brownies to bake. 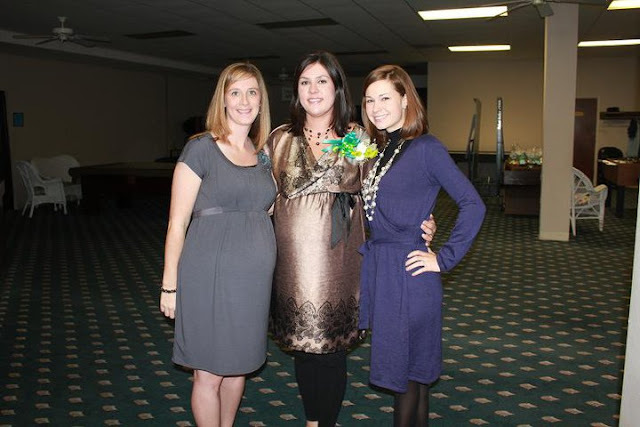 After that, it was time to get ready for Lauren Puckett's baby shower! I can't wait to meet little Hudson and can't believe he will be here so soon! Lauren got TONS of cute baby swag to ring in Hudson's arrival! I realized that other than a baby "party" in a bar a few years ago, I haven't been to an actual baby shower since my friend Emily Smith's shower--that's right, the shower for her before she was born, and it just so happens that Emily started college last fall! Clearly I am rusty!!! After the shower, I met Forrest at the funeral home for our dear friend, Gordon Isbell Jr's visitation. We have been close with Gordon and his family and it was a sad day for all of us, but Gordon was such a fun character, it was hard not to smile and laugh! After visiting with the Isbells for a while, we had to run to church to speak. We are VERY excited to be starting a "Young Marrieds" group and church and we are hosting the first event next weekend, so Forrest and I attended each Mass to invite the YM's to come. It kept us busy but it was really fun and we had a great response! After Mass, no rest for the weary. We ran home changed, and braved the storm out to the Walnut Gallery Gala. Denise was on the board and so we were super excited to support her efforts! The Gallery is fairly new in town and this was their main fundraiser of the year. 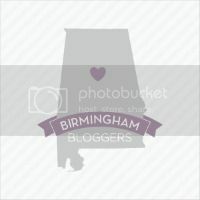 They are non-profit and are really dedicated to promoting the arts in Gadsden! A perk of attending the gala was that each ticket holder received a handmade bowl by some of the artists whose work is currently being featured at the gallery: Steve Loucks and Lynnette Hesser. Isn't our bowl cool? Forrest actually took a ceramics class in college and was very into it and actually really good, so he had a great time discussing the art with Steve and Lynnette. The whole night, actually, was so much fun! The food was really good and we saw several friends there. I hope that we get to go to many more events at the Gallery in the future! When we were leaving, we walked out with Justin and Farrah and the guys were discussing that they were hungry again. Well, what do you do when it is late and you are hungry? You go to Waffle House. Yes, this is the 2nd time in just a few months that the Bailey's have yet again ventured to Waffle House, and this is the 2nd time that we were not disappointed! On Sunday we went to speak at the 8am Mass, ran a few errands (which included a stop at Jack's for breakfast--a real treat!) and then went back to the 10:30 Mass. After all of our churching, we went home for another quick change. Forrest stayed busy in the yard all day while I went to the Gadsden Service Guild New Member tea. So many great girls got in this year (including Farrah, Denise, Sarah Kathryn, Kristen, and Lisa, just to name a few friends) and they all seem eager to be a part of our group! The tea was a lot of fun and was the perfect way to mix and mingle with all of the new girls, as well as the "old girls"! After the tea, I went to my Aunt's for a while before picking up Forrest to go to dinner at Mom and Dad's. Beef tenderloin kabobs--yum! Can you tell why we are both dragging today??? Sounds like you had a busy weekend! And that bowl is just plain gorgeous!